Grizzly bears are magnificent animals. They can be dangerous to humans, particularly if surprised or if humans come between a mother and her cubs. The male grizzly can weigh more than 1000 pounds and can stand 10 feet tall. What does the Grizzly Bear eat? Grizzly bears are powerful, top-of-the-food-chain predators, yet much of their diet consists of salmon, trout, nuts, berries, fruit, leaves, roots and insects. Bears also eat other animals, from rodents to moose. 25 years in the wild. How many Grizzly Bears can be born at a time? Typically 2-3 but 4 are possible. Females give birth during their winter rest and their offspring are often twins. Grizzlies once lived in much of western North America including the Big Bear Valley and even roamed the Great Plains. Early settlers gradually eliminated the bears from much of this range, and today only about 1,000 grizzlies remain in the continental U.S., where they are protected by law. Many grizzlies still roam the wilds of Canada and Alaska, where hunters pursue them as big game trophies. They can be dangerous to humans, particularly if surprised or if humans come between a mother and her cubs. The male grizzly can weigh more than 1000 pounds and can stand 10 feet tall. Grizzlies are solitary animals but do congregate when the salmon are swimming upstream for summer spawning. During salmon season, dozens of bears may gather to feast on the fish, craving fats that will sustain them through the long winter ahead. Grizzlies are easily identified by their long, curved claws, shoulder hump and concave or dish-shaped face. Grizzly bears can run up to 35 mph but they can only do so for short distances. Grizzlies are sprinters, not marathon runners. 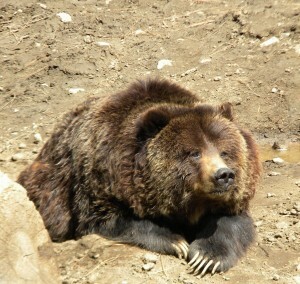 Grizzlies, like all other bears, retreat to their den in winter, yet grizzly bears are not true hibernators. Their body temperature drops only a few degrees and breathing rate slows just slightly. What’s more, grizzlies sleep lightly and are easily awakened from their winter slumber. Tutu – is the mother of our other two grizzlies, Harley and Ayla. She and the babies came to us in 1996, when she was almost 13 years old. Her two babies were about 6 months old at the time of arrival to their new home. Tutu was a three strikes bear, she had raided campsites and bakeries, she had bluff charged people and she was teaching her offspring to do the same. They relocated her three times and she kept coming back with the same behaviors. Someone had to take her and the babies or they would be euthanized. So the Big Bear Alpine Zoo agreed to take all of them, and we built an exhibit, thanks to an outpouring of many donations, while Woodland Park Zoo held them for us. They are the only family of Grizzly Bears together in captivity in all of California, and possibly in the U.S.
Ayla – is our young female, but she is bigger than her mom because she has had good food all her life and plenty of it! Ayla is a little more independent than her brother, and probably a little smarter. She sat back and watched while Harley and her mom tested the electric fence and then decided she did not need to touch it herself. Harley – is very much a mama’s boy. He was very upset when we had to separate them for the journey to their new home from Woodland Park. He never stopped crying. When we gave them coconuts for the first time, Harley was the one that figured out how to open them. He always shares with his mother and sister, but of course he always takes the largest piece for himself. They all absolutely love the coconuts as well as pomegranates, honey, and molasses. 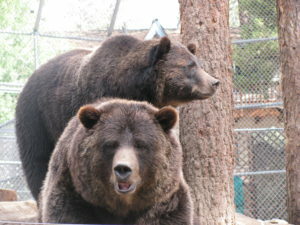 We are very happy to have Grizzly Bears at our Zoo because Big Bear was named after them. They were hunted to extinction in the early 1900’s in the Big Bear Valley, so it’s nice that they have finally come back home where they belong.